Measurement of pores as low as 10 nm typically use intrusion of a non-wetting liquid such as mercury while larger pores are assessed using techniques such as capillary flow. 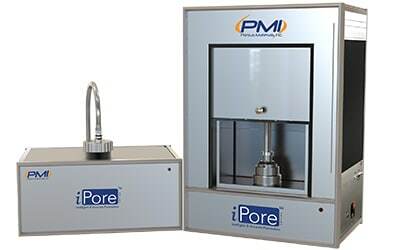 i Pore is based on capillary ﬂow porometry, where a non toxic wetting liquid is allowed to spontaneously ﬁll the pores in the sample and a non reacting gas is allowed to displace liquid from pores. First the largest pores will get emptied, as they require lower pressure than smaller pores. As the pressure is increased, more and more smaller pores are progressively emptied. The pressure and ﬂow rate of gas through the emptied pores provides the through pore distribution. The pressure at which through pores empty is inversely proportional to the pore size. Through pores are the pores connected from one side of material to the other side. i Pore capillary ﬂow Porometer measures the pore throat diameter, which is the most constricted path of the entire pore. Bubble point, pore size distribution, pore flow distribution and density can all be calculated. Contact us for a quote or to discuss your pore size analysis needs. Investigate the porous structure of solid samples quantitatively with mercury pore size analysis. 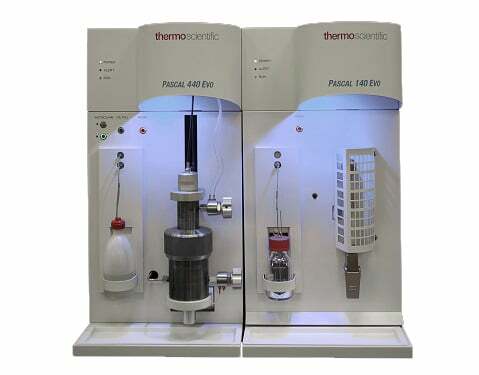 Thermo Scientific™ Pascal Mercury Porosimeters provide reliable information about pore size/volume distribution, particle size distribution, bulk (envelope) density and speciﬁc surface for most porous solids using Pressurisation by Automatic Speed-up and Continuous Adjustment Logic, Pascal.Building on the success of the Pascal range, the new Pascal Evo features enhanced performance and additional software features. Two high pressure models are available together with a Macro pore unit or mercury filling device. Using the P.A.S.C.A.L pressurisation system. All modules feature this proprietary pressurisation procedure that automatically (and easily) determines the correct speed collecting data at the real equilibrium, without any need of expertise or previous knowledge of the sample. A total of up to 20,000 pressure points can be measured on the intrusion and extrusion cycles on the Evo with increased pressure resolution. The instruments are fully controlled using the software which also allows for external control for maintenance and service issues. Low cost of use is down to affordable sample chambers (dilatometers) which minimise mercury use, and the dilatometer is always in vertical position in any phase: degassing, mercury filling, low pressure experiment, high pressure experiment. This means that the hydrostatic pressure over the sample is always measured and used to correct the real pressure over the sample, this is particularly important especially at low pressures that is to say with macro and ultra-macroporous materials.